(York, Pa., March 1, 2018) - The York Revolution have made three more player signings to the 2018 preseason roster, welcoming back infielder Ryan Dent while adding Atlantic League All-Star Zach Wilson and right-handed pitcher Zac Grotz. The signings were announced by manager Mark Mason on “Revs Hot Stove Weekly presented by Shipley Energy” Tuesday night on SportsRadio 1350 WOYK. Dent saw time at all four infield positions for the Revs in 2017, ultimately becoming the team’s everyday shortstop. At the plate, the 12th-year pro batted .266 with five home runs, 21 doubles, and 46 RBI during his first season in York. Dent spent his first eight pro seasons in the Boston Red Sox organization and two more with the Chicago Cubs, reaching the Triple-A level with both clubs. The 28-years-old was a first round selection (62nd overall) of the Red Sox in the 2007 amateur draft and is a career .235 hitter with 42 home runs, 309 RBI, and 103 stolen bases. The Long Beach, CA, native was named the Red Sox Minor League Defensive Player of the Year in his third pro season in 2009. Wilson has been one of the league’s most prominent offensive threats, spending the past three seasons with Southern Maryland, where he has combined to bat .284 with 42 home runs, 75 doubles, and 177 RBI. 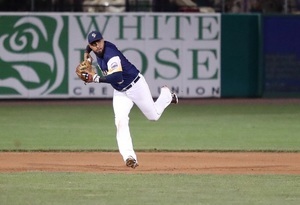 Last year, the corner infielder batted .282 with 14 home runs in just 80 games and was selected to the Atlantic League All-Star Game, where he won the league’s Home Run Derby and was named the game’s MVP after clubbing a three-run homer, helping lead the Freedom Division squad to victory. Wilson batted .291 in his first Atlantic League season in 2015, which tied for the fifth highest mark in the league, and rapped 31 doubles, which tied for third. He followed that performance by belting a career-best 19 home runs in 2016 while ranking third in the league in doubles (34) and fourth in extra-base hits (53). The Long Beach, CA, native was a 21st round draft pick of the New York Yankees out of Arizona State University in 2011 and spent his first four seasons in the Yankees system, reaching Double-A Trenton. Grotz signs with York after his rights were acquired from Bridgeport in the player dispersal draft last fall. The 25-year-old went 4-3 with a 3.77 ERA in 67 appearances, a total that tied for the league lead, during his first Atlantic League season in 2017. He notched a pair of saves and struck out 80 batters in 74.0 innings. The righty dominated in the Frontier League the previous year with Washington as the team’s closer, going 4-2 with a 1.36 ERA and 10 saves. Grotz was originally selected in the 28th round of the 2015 draft by the Houston Astros, and spent one season in both the Astros and Los Angeles Dodgers organizations. The San Mateo, CA native is 17-8 with a 2.64 ERA and 17 saves in his career and enters his fourth professional season in 2018. The Revs now have 12 players under contract for the upcoming season, with more signings to be announced live during the next airing of “Revs Hot Stove Weekly presented by Shipley Energy” on Tuesday, March 6, at 6:30 p.m. on SportsRadio 1350 WOYK and www.woyk1350.com.